During my educational career at Florida State University, I have been given many opportunities to intern with different professional artists in many different fields. From the multitude of available internships, I knew I wanted to work with artists towards museum exhibitions, learn the theoretical and practical disciplines of curation, and become proficient in my knowledge and practice as a preparator of a variety of spaces offered within a gallery. This semester, I decided to choose to intern at the Museum of Fine Arts, under the mentorship of Wayne Vonada. Wayne is the Senior Preparator for the museum; however, I have learned so much more than just his titles allows credit for. Between hanging each show as well as discussing and understanding the importance of each work’s place amongst the others which can improve or hinder an overall exhibition, Wayne and I have found every new task with a new outlook which has broadened my perspective on what can constitute a proper show in a museum. Each show has a plethora of nuanced decisions that can take much longer than anticipated to complete. Wayne taught me how to manage my decisions and tasks that has become a method I apply each time he tells me what we need to do on each new day I am with him. 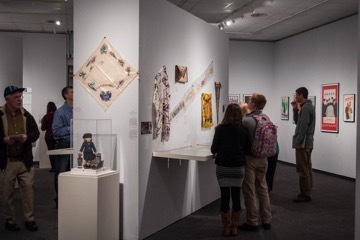 Through this semester, the Museum of Fine Arts has exhibited two shows: “The Annual Faculty Exhibition” as well as “World War II: The Human Experience”. We are currently setting up for our final showcase of the semester, the Bachelors of Fine arts and Masters of Fine arts exiting show. Wayne told me this would be my opportunity to coach some of the graduating students through the exhibition process and pass on some of the information he has taught me during my internship. Though it can be difficult to manage the internship with my school and work load, I have found the experience extremely enriching, and has given me a well developed understanding of the necessary knowledge and tools to continue such a position in another gallery or museum in the future, which could even possibly even help my receive a job somewhere else. Although I have enjoyed the knowledge and skill set gained during this internship, what I believe I will remember the most is the interactions with students, faculty, and other museum-goers that have stopped by during my time in the, as well as the friendship I have made with Wayne and my fellow interns.